When a monster declares an attack: You can Special Summon this card from your hand in Defense Position. You can only use this effect of “Vampire Fraulein” once per turn. Once per battle, if your Zombie monster battles an opponent’s monster, during damage calculation (Quick Effect): You can pay LP in multiples of 100 (max. 3000); your battling monster gains that much ATK/DEF during that damage calculation only. At the end of the Battle Phase, if this card destroyed any monster(s) by battle: You can Special Summon them from the GYs to your field. We’ve got a Vampire Week on CoTD comin at you and the first one up is the lovely Vampire Fraulein. Strong DEF and very easy to Special Summon, Fraulein being a Level 5 works well with the Xyz Summoning Vampires typically like to do. Her addition to the filed will cause a replay and give you a material for Link Summoning in addition to whatever monsters you already have on the field. Trading LP to bump up a Zombie’s ATK or DEF up to 3000 once per battle is like having a Megamorph that doesn’t backfire on you. On top of that, Fraulein has a Goyo Guaridan effect as well to get in some extra damage and Special Summoning options. DARK, plently of support behind her, Special Summons herself, brings monsters back that she destroys, and can bump up any Zombie by up to 3000ATK/DEF. Fantastic card for the archetype, a great card by herself. After a week for both Sky Strikers and Fur Hire, we now get to the legacy archetype in the set that got new support, Vampires. This week we start off with Vampire Fraulein. Fraulein is a Level 5 DARK Zombie with 600 ATK and 2000 DEF. The ATK is abyssmal for a Level 5, but DEF makes up for it pretty well. Being a DARK and Zombie, however; has major benefits. Once per turn, you can Special Summon a Vampire Fraulein from the hand in Defense Position when a monster declares an attack. Very easy way to summon this considering attacking is key for 99% of decks to win. Once per battle, when a Zombie monster battles an opponent’s monster, you can pay anywhere from 100 to 3000 LP and if you do, your Zombie will gain ATK equal to the LP you paid during damage calculation. Unless the monster you are battling has 3000+ ATK than your Zombies, you should be guaranteed to kill the opponent’s monster. You can either just pay enough until your Zombie has 100 ATK more than the opponent or just pay 3000 and do as much damage as possible, but only pay 3000 when you either have to or have more than enough LP to. If Fraulein destroys a monster in battle, you can Special Summon all the monsters it destroyed in battle that turn to your field at the end of the Battle Phase. 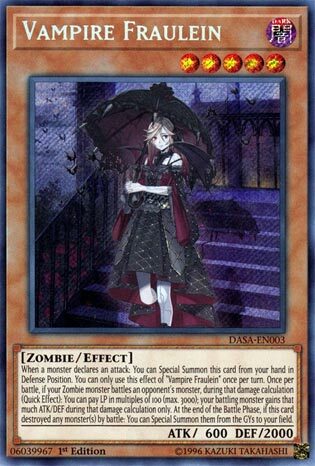 This would fuel the Rank 6 Vampire considering it can use any monster your opponent owns on your field, no matter what the level, but with 600 ATK, you will likely have to pay LP with Fraulein’s effect to kill something. Fraulein is solid support for the Vampire archetype and helps fuel your Rank 5 plays, it is most certainly a 2 to 3 of. Art: 4.5/5 Vampires have great artwork. It’s Vampire week here, as we continue to delve into new things, albeit in the start of summer, as opposed to Halloween. Vampire Fraulien is a Level 5, Dark, Zombie with only 600 attack but has 2000 defense. Immediately, we notice the stats aren’t good at all for her Level, so what can she do? She can Special Summon herself from your Hand when a Monster declares an attack (any Monster, so you can use this offensively or defensively, on either your or your opponent’s turn). You get to bring her out in Defense position, so that makes things a little better. Next, once per Battle, if your Zombie battles an opponent’s Monster, as a Quick effect during Damage Calculation, you can pay Lifepoints equal to 100x for your Monster to gain that much attack and defense (capped at 3000 to be paid). That makes this card, as well as any of the Zombie/Vampires potentially gigantic powerhouses. Obviously you aren’t going to want (or likely be able to pay) insane amounts of Lifepoints more than once or twice, but for modest boosts (say under 400-800) enough to get over who you’re battling, or maybe one gigantic finishing shot. Finally, if this Monster destroys Monsters in Battle, you’re able to Special Summon them to your Field (in attack or defense position) and that’s only if you choose to. That’s great to have the option, cause if you’re taking down weak or irrelevant Monsters, you probably don’t need them. She’s unconventional and different, but she can be useful.